This piece is the first of Carolan's unnamed pieces. It is now called Carolan's Welcome. 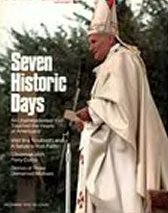 The picture above is the cover of a magazine that tells the story of Pope John Paul's historic trip to Ireland, and the UN in 1979. One of the biggest highlights in the career of The Chieftains came at Phoenix Park in Dublin where they played before a crowd of 1.35 million people during the visit of Pope John Paul II to Ireland and were the opening act. Since they played this tune to welcome the Pope to Ireland, it has acquired the name of Carolan's Welcome. It was previously known as the first of Carolan's unnamed tunes.